My daughter leads a simple life.  She loves to watch daily soap operas in Tv, She also loves to read novels. She is Asstt Mgr in State Bank of India. As it is visible she wears formal clothes in which she feels comfortable in job.Would like someone as groom who will share her burden to lead a good life. We belong to a middle class, nuclear family having moderate outlook. Our family is settled in Bhilai Nagar. Her father has retired while her mother is a homemaker. She has 1 brother.